MP3 file creation software (compressed audio files, up to 20 times smaller in size than a WAV file containing the same audio data). - Very simple intuitive use - Conversion of WAV -> MP3 and MP3 -> WAV files by simple drag & drop - Quality configurable for MP3 encoder (from 32 to 320 Kbits/s) - Extraction of MP3 or WAV files from an audio CD - Creation of MP3 autoplay CDs - Automatic recovery of album title, performer and song titles via Internet (CDDB) - Can be used as audio CD player - Fully configurable (player type, speed, CDDB site,....) - Player included! 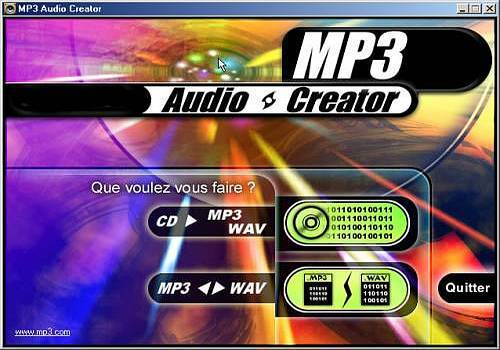 (fully configurable WAV and MP3 file player) The ideal tool to create your own MP3 compilations!